Our ministries focus both on the work within our parish and our engagement with our community. Even though our community is small in numbers, we believe that God invites us to work with God in God's misson in our community. We identify those places where our gifts match local need and collaborate with God in God's healing presence in the world. We also provide for the needs of our church community by serving on worship teams, singing in the choir, and the pastoral team offers pastoral care and visits the sick and home-bound. Our community gathers on Sunday and Holy Days to worship God. The community offers its gifts which include singing in the choir, proclaiming the lessons from the bible, preparing the church for worship and offering snacks for coffee hour. 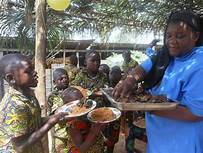 We provide for two orphans at the Good Shepherd Home for Children located in the North West Province of Cameroon, an area in West Africa where an estimated 50,000 children are orphaned. Over 150 of those children have found a home at Good Shepherd where they are sheltered, fed, clothed, educated and most of all, loved. 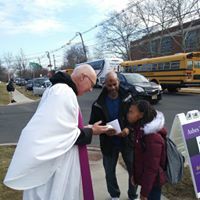 Every Lent, the members of the parish restrict their spending on foods or luxury items and donate the money to the Elizabeth YWCA home for persons enduring domestic violence. Our annual support for this agency reflects our commitment to improve the lives of women, men and children who find themselves in abusive relationships. 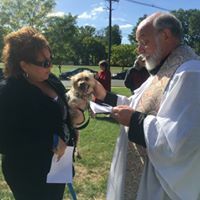 On the first Sunday in October, we offer a blessing of the animals at our church. If the sun is shining, we gather on the great lawn of our parish. If it is raining, our service takes place in the church. We offer prayers of thanksgiving for our pets and every pet is individually blessed. We support the Linden Interfaith Network for Community Services Food Pantry (LINCS) throughout the year. 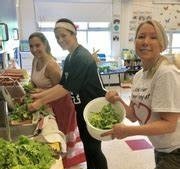 The pantry services approximately 200 Linden families. We identify a particular item each month and bring that food item to church. One of our members volunteers at the Food Pantry and brings the collected food to their distribution center. At Christmas, we partner with the City of Linden Special Services Department to provide Christmas gifts for twenty Linden school children. Children provide a wish list and members of the church purchase gifts for these children. The Clergy and trained pastoral assistants visit the sick and the home bound bringing the Holy Eucharist and listen to them. Every Sunday we offer prayer and anointing for healing during our worship. Every summer we sponsor three children at the Appalachian Reading Camp. The camps run during June and July and during the school year for children entering grades 3,4 or 5. Reading Camp meets the educational, social and emotional needs of these children each summer. Twice a year, we organize a Rummage Sale and Flea Market to provide discounted household items and clothing as well as provide an opportunity for local vendors to sell a variety of goods. Our Christmas Boutique offers new and gently used decorations and Christmas gifts for the community.